00:59 | Thailand’s King Maha Vajiralongkorn Bodindradebayavarangkun yesterday presented Prime Minister General Prayut Chan-o-cha, with a royal flame which will be distributed to officials in all Thai provinces, as well as foreign countries, to be used during the upcoming royal funeral ceremony. 02:18 | Thailand King Maha Vajiralongkorn Bodindradebayavarangkun, accompanied by Princess Maha Chakri Sirindhorn and Princess Sirivannavari Nariratana, officiated at the installation of the Nine-Tiered Great White Umbrella of State atop the royal crematorium at Sanam Luang cremonial ground yesterday. 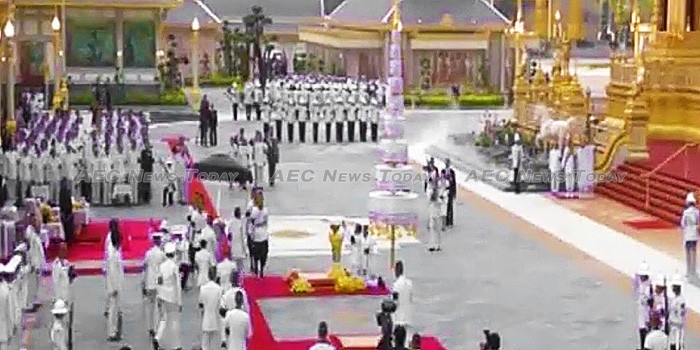 04:12 | Officials nationwide are putting the final touches on landscape around royal crematorium replicas ahead of the royal funeral commencing October 25. 05:53 | Interior Minister General Anupong Paojinda has presided over a meeting with provincial governors, public servants, and state enterprise employees nationwide to ensure readiness and to provide guidelines for local ceremonies for the royal funeral ceremony. 06:59 | Police General Wirachai Songmetta, acting deputy commissioner-general and spokesperson for the Royal Thai Police (RTP) has provided details of 42 rads to closed to traffic on October 26, the royal cremation day. The number of roads closed to traffic will increase over the three days leading up to the ceremony. Motorists will be able to park their vehicles at several designated parking lots on the outskirts of Bangkok and take free shuttle buses to Sanam Luang. 08:22 | Newsline takes a look at the first of three exhibitions to be organised by the Bangkok Art and Culture Center (BACC) to commemorate the passing of the late King Bhumibol Adulyadej. 18:51 | General Boonsang Niampradit, chairman of the National Reform Committee on Judicial Administration (police), has announced that government-appointed police reform committee is expected to have its initial report ready for presentation by next week, with 80-90 per cent of the tasks having been accomplished. 20:05 | The Public Relation Department (PRD) and the Ministry of Social Development and Human Security (MSDHS) have teamed up to produce a TV programme for people with disabilities featuring the accomplishments and achievements of the ministry. 21:18 | According to Bangkok Flood Control Center (BFCC), Bangkok and its vicinity will have a clear sky this morning. Meanwhile, typhoon Lan in the pacific ocean is not likely to effect Thailand. 21:43 | Newsline rehashes a previously broadcast story on the poverty of Cambodian labourers who choose not to migrate abroad despite low pay in their own country. Newsline is a daily Thailand English-language news and current affairs programme produced by the National News Bureau of Thailand (NNBT) under the Thailand Government Public Relations Department (PRD) for *NBT World. AEC News Today publishes Thailand English-language News M-F.